Power corrupts, absolute power corrupts absolutely. Lord Acton’s dictum could well be applied to the Chairman of Strollers’ Tours were it not for the fact that our Chairman was shown to have if not feet of clay at least liquid ones. 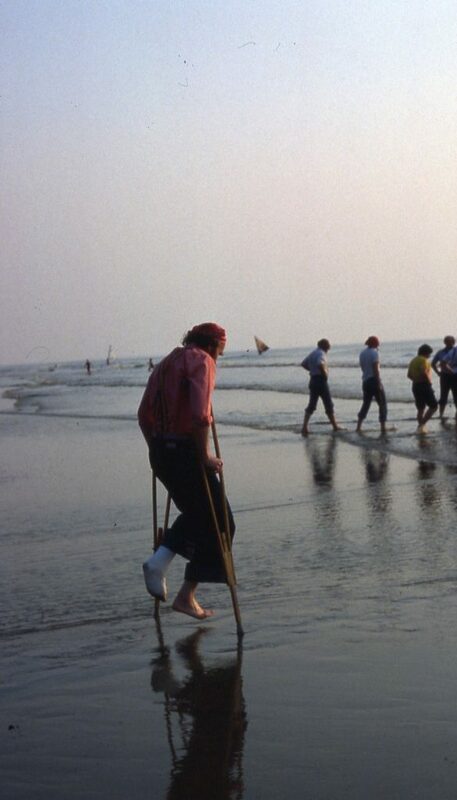 Having spent 3 days on the 1981 Amsterdam Tour suffering from calls of “dead ants” in the most inconvenient of places (to all but the Chairman) we relaxed at Zandvoort on the way back home and went for a paddle. Cue the vice Chairman Jiff Trippas who also had the authority to call “dead ants”* to subtly summon the paddlers back to dry land leaving a Chairman blissfully contemplating the privileges of power while paddling up to his calves in splendid isolation. Did he show comradely Stroller spirit and go down on his back like the rest of us? Did he heck. Perpetual shame on him. * The Chairman hotly disputed Trip’s authority both at the time and at frequent intervals over the last 36 years and counting – and much good has it done him!